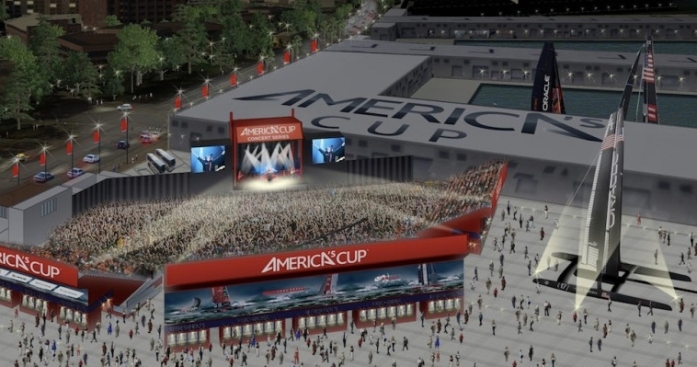 The America's Cup Concert Series could have as many as 30 events between May and October. San Francisco's Entertainment Commission is holding a hearing this evening on the scaled-back plans for a temporary waterfront concert venue being built for the America's Cup races later this year. The commission is meeting at 5:30 p.m. in Room 416 at City Hall on plans by race organizers for a 9,000-seat venue at Piers 27-29 that initially was set to host up to 40 concerts and other events between mid-May and October. However, concerns among neighbors in the area have prompted a reduction in the number of concerts and other changes, said Matt Prieshoff, chief operating officer for Live Nation Northern California, one of the organizers of the concert series. The plans are now for a maximum of 30 concerts through October, Prieshoff said. Organizers also plan to set up an acoustic curtain on the back and sides of the stage -- which faces the water -- to reduce the amount of noise in the surrounding neighborhoods, Prieshoff said. "The primary objective is to keep the sound from going backwards," he said. Additionally, a community hotline will be set up to take noise complaints, according to Prieshoff. Jon Golinger, president of the neighborhood group Telegraph Hill Dwellers, said, "We're happy they made some changes, but we're still opposed to the plan as is." Golinger said members of the neighborhood group plan to attend this evening's meeting to ask the Entertainment Commission to hold off on approving plans for the venue until organizers make more commitments to reduce the noise. Among the commitments being sought are mandatory financial penalties for noise violations, Golinger said. "Too often, promises are made and in the heat of the event, the volume is all the way up to 11," he said. Golinger said the waterfront neighborhoods have already had issues with the annual music festival on Treasure Island, where noise carries across the Bay and into their homes. "People tell me the Treasure Island festival felt like the band was playing right outside their window," he said. The first concert scheduled on the America's Cup website is by Imagine Dragons on May 31. Other artists scheduled to play at the venue include Sting, the Steve Miller Band, Train, Heart, Jason Mraz and Fall Out Boy.